Everything you need to know for your experience with us. I have allergies, can I play? Is the experience suitable for players with disabilities? Do you serve alcohol or other refreshments? Can we play as a team of two? More than 7 people want to play, can I book multiple games? Once I've booked can I add additional team members? Do you have a waiting room for non-players to wait? Escape Quest is an unique storyline driven activity for teams of 3 to 6 players based on the popular game genre of room escape with an element of hidden object games too. The aim of the game is to work with your team mates to solve riddles, puzzles and clues while also looking for certain objects to find a way out of the game area within the 60 minute time limit. During this time you will be constantly monitored by the game controller via CCTV, who will feed you clues which could help your progress. Players can expect their total experience (including the briefing & debriefing) to last approximately 80 - 90 minutes. Escape Quest's games are enjoyed by a wide range of people. If you enjoy solving puzzles and work well under the pressure of a time limit, then this is the game for you. Teams can be made up of family members or friends to take part in this fun but challenging experience, or even work colleagues as a team building excersise. Working well with your team-mates is the key to a successful escape. Here at Escape Quest we are firm believers in quality over quantity. With that in mind, we only run one game at a time. We want your game to be as enjoyable and engrossing as possible. We strive to open new rooms as often as possible, by doing this we ensure that our players can return time and time again to enjoy a new unique game that is just as enthralling and demanding as it was on previous visits. Escape Quest's challenging puzzles, riddles and clues are designed for adults, but we welcome players of any age over 12 years old(14+ in Mr Chuckles Funhouse). Under 18's must be accompanied by at least one adult aged 18+ per child, with a minimum of 2 adults per game. There are no upper age limits to our experience, as there is no physical aspects to the challenges within the game (no heavy lifting or climbing). If you are pregnant please give us a call so we can brief you on exactly what to expect, that way you can make your own mind up as to the suitability of the game. Obviously, we are aware that the severity of claustrophobia varies from person to person. We can assure you that the majority of our game rooms are of a comfortable size even with the largest sized team playing. The entrance door and/ or an emergency exit remain unlocked throughout the experience, meaning you can leave the game at any time. Our Mr Chuckles Funhouse game, however, is designed to be played in dark enclosed spaces, so we wouldn't recommend this game for players who suffer with claustrophobia. The games are monitored constantly throughout your time in the room, so if needed you only have to signal for help and one of our staff will assist you. To add to the atmosphere of our games we do use various effects & materials that may effect allergies. If you do suffer with any, please call us on 01625 437437 to check with us. We will do everything we can to assist guests with disabilities. We recommend you get in touch with us via our contact us page or by calling 01625 437437 before booking to discuss your requirements. There are aspects of some of our games that we need to make you aware of such as space within some rooms, floor coverings, physical, sight and noise based puzzles. This varies from game to game. We are located on the 1st & 2nd floor of an old mill and do have stairs at the front of the building, but we can assist you with access to the 1st floor if required. Escape Quest games are only available by pre-booking online or calling our order line on 01625 437437, if a game time is available you can book any time from 4 hours in advance up to three months before the date you require. You can secure your experience very easily, just go to our booking page. There you can choose between our games, the date & time required and the size of team you would like to book for. Here you can also use any discount codes you may have. Alternatively you can call us on 01625 437437 to book your time slot. ​Games must be paid for in full at the time of booking. Payment is accepted via Paypal, though you do not need a Paypal account to process your payment. Payment using the code found on our gift vouchers may also be used on our online booking system. Part payment can also be made using various discount/ voucher codes that will be made available from time to time through promotional offers. Our games are designed to be a fully immersive experience, therefore we only run one game at a time. This allows us to give you & your team a very personal experience with our complete attention during your exclusive booking slot. If you require more than one team, please call us on 01625 437437 to arrange back to back games with no waiting time in between. Our games are designed for 3-7 players. Due to the complexity of the games we do not recommend or take bookings for teams of 2, as this can make the challenge too difficult & ultimately affect your enjoyment of our games. We ask for players to arrive 15 minutes before the time of your booking, this is to ensure all players are present once the game briefing begins and allows you to start the fun as soon as possible. During games, or before this time, no access to the building is available. Unfortunately, we DO NOT have facilities for non-players to wait during games. We can however, highly recommend The Silk Trader pub which is situated less than 100 yards down the road. This friendly Robinson's pub is the perfect place for non-players to wait for their family/ friends, as well as being the perfect venue for a post game drink & something to eat. If you are running late, please call us on 01625 437437 to let us know as soon as possible. We will do what we can to allow your game to go ahead, although you may not get to enjoy the full experience, due to bookings after yours. However, if you arrive more than 15 minutes after your booked time, then we will unfortunately have to cancel your game and no refund will be issued. 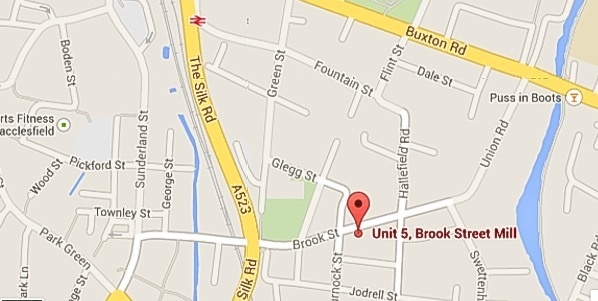 There is a small free car park on Jodrell Close (SK11 7AS) off Jodrell Street, about a 2 minute walk away. Both the train station (Sunderland Street) and the bus station (top of Pickford Street) are approximately a five minute walk away. If you have any other questions that aren't covered here please feel free to contact us, we are here to help make your experience as enjoyable as possible.